It can’t be emphasized enough that if you want to be successful with your health, you have to do two things: plan ahead and prep for success. As Thanksgiving knocks on your door, it’s time to formulate a plan that you feel good about and then set yourself up with preparations and inspirations to be successful. There is a huge difference between waking up and celebrating your Turkey Day with family, friends, a long walk, football on the television, and ending the day with a slice of pie, and a week or month of trying recipes, holiday drinks with friends and a fridge full of leftovers that could feed an army. Your body can handle the first choice and carry about healthfully the next day, but the month long celebrating negatively impacts your energy, weight and health. Treat Thanksgiving as the one-day celebration it is – or better yet, one meal, sandwiched between your regular healthy breakfast and veggie snacking style — and stick to your healthful ways for the rest of the month. Instead of waking up and tasting the stuffing, picking at the corn bread and nibbling at the candied sweet potatoes all day long . . .
Wake up and have your go-to healthy breakfast. Planning to start your day off healthfully will give your digestion a shooting chance at successfully making it through the day in your holiday pants without the bloat. Absolutely consider a little kombucha, kefir or yogurt with your mid morning snack, as the friendly probiotics will help you gracefully digest all day long. 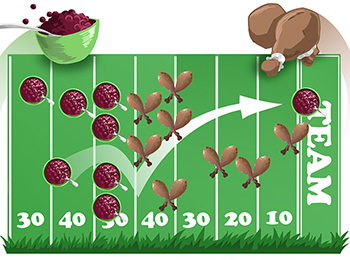 For the feast, load up on the healthy stuff: the veggies, turkey and cranberry sauce should take up most of your plate. The indulgent gravy, stuffing and mashed potatoes should be kept to a couple tablespoons each, and savored mindfully (nobody is going to steal your plate away, so don’t rush!). Post feast, plan for a cup of tea to soothe your GI tract and re-establish your satiety. As you check out the sweet treats, plan for enough dessert to feel you’ve celebrated, but not so much that you feel regretful. Wear an outfit you feel great in, not one you can hide in. No bulky sweaters and elastic waistbands allowed! Exercise in the morning. If you’ve exercised, eaten your usual healthy breakfast and hydrated well, you’ll be more inclined to keep up your hard work for the rest of the day, or at least not derail too much. If you are worried that the hype of Thanksgiving eating is going to cause irreversible weight damage and you are dreading it weeks in advance, you are (like many of us) missing the point of the day. Once you’ve planned and prepped, relax and focus on the ‘thanks’ part of the day by focusing on your loved ones, being in the moment and making new memories to cherish.